Yi Quan, like Tai Qi, Ba Gua and Xing Yi, is part of the Chinese Internal Martial Art family. This art was developed by renowned master Wang Xiangzhai in the 1920´s and first taught under the name Yi Quan (Will Boxing) in Shanghai. To distil to the very essence the Internal Martial Arts with no frills. Wang Xiangzhai was born in Shenxian county, Hebei province on 29th October 1890. When still a boy, he practiced Xing Yi Quan, under one of its greatest masters, Guo Yunshen, who taught him a great deal before he died. Thereafter, Wang dedicated himself to learning martial arts and travelled China seeking out masters, including a visit of several months to the Shaolin Monastery in Henan. The results of his studies, was the development of his own unique style, developed to stress the importance of the “Will” or Mind Intent (Yi) and to “re-establish the original sense and quality of Xing Yi Quan”. Later, he moved to Beijing and further developed the style into Da Cheng Quan (Great Achievement Boxing) and taught many students before his death in Tianjin in 1963 at the age of 73. The essence of Yi Quan is to break away from rigid structures imposed in the other internal arts, always of course adhering to essential concepts of posture i.e. “connecting and rooting the body”. The belief is that no form is the strongest form. Wang rejected the traditional methods of detailed and “set forms” as a training method and emphasized the simplicity of the essence of natural energy by raising “mind-intent” (Yi) to a high level in martial arts training. Mind intent (Yi) is something employed in all internal arts and with Yi Quan it is elevated to a level at least equal or more important than just body movement. Yiquan is neither a training of the mind nor a physical practice alone, the two must be harmonized. The essence of Yiquan can only be cultivated by harmony and integration of both the mind and body. Visualization of various images ( e.g. a tree growing with roots spreading into the ground and branches waiving in the air) should be used in relaxed standing (Zhan Zhuang) to direct neuromuscular coordination that results in whole-body harmony (Zheng Ti Xie Tiao) and mind-body synthesis (Quan Shen Zhi Fa Xiang He). We also work to set off one muscle group against another in a relaxed way to provide a dynamic tension in the body , a kind of isometric exercise (Mao Dun Zheng Li, ????) in order to find , sense, feel, understand , explore inside the body, experience, and finally cultivate, and master the whole-body “balanced force” (Hun Yuan Li, ???). An example would be where we feel the arms lifting up and yet at the same time being pulled down by giant elastic bands. This kind of stuff is subtle and can be used in legs, torso, neck, and arms, everywhere really. A series of standing meditations, many of which are only used in this style, e.g. Combat Pile Stance, utilized to build energy or “Chi” in the body and promote a strong connection or “root” with the universal energy. The practice is basic standing, and some advanced postures, examining in detail the correct use of body weight, and feet, hand, leg, arm, waist, shoulder, and back position. This standing alone is a powerful Qi Qong and health exercise, and is recognized by most masters as the most direct method of building a root and internal strength. It ain’t easy though! I’ve seen big guys with bulging muscles unable to stand for more than 5 minutes! However as with all things, practice makes it much easier. These are a series of slow smooth movements, performed standing still, walking or stepping quickly, with repetition to test or “trial” how the energy is moving in and outside the body. Training includes, amongst others, the following “Jins”: pushing, lifting, crushing, wrapping, pulling, extracting, spiraling, coiling, etc. This is a really tough one for students to grasp and feel! The idea is to move from a standing posture Zhan Zhuang where the energy inside the body is totally alive, but little exterior movement to Siu Li where you are now starting to put the body in motion and feel the live interior energy connect with the exterior energy. These are stepping movements to practice advancing and retreating in small and large steps and further build energy. Yi Quan like Xing Yi always prefers to advance as opposed to retreat! Stepping includes, Chicken step, Snake step and Crane step, in fixed stepping and free stepping patterns. It also includes deceptively simple steps, which are extremely useful in combat. We use the vocal chords with a resonance down to the stomach or diaphragm to shout or grunt at a deep level to vitalize the whole body and manifest the maximum amount of energy discharge. We also use it in different ways to “smooth” the energy in the body to ensure it reaches all parts. This is practiced in varying forms to discharge energy in a focused manner, once it has built up in the body. We practice in various directions and different body movements, discharging to front, sides, up and down. Yi Quan pushing hands is similar to Tai Qi, but with unique movements, to assist both players to test discharging, rooting, balance, sensitivity, etc. Trained with one and two hands, either standing still, in fixed movement patterns or completely free movement, forward, back and all sides. Typically done more actively and often more aggressively than other pushing hands. At a more advanced level, we mix in Fa Li with Tui Shou, to give the student the feeling of discharging and also being on the receiving end of that energy! Here we have a lot of fun with actual free style sparring with a partner! We also do the Yi Quan Dance done solely with no fixed form, and sole shadow boxing. We believe that pushing hands is great up to a point, but after that you need to spar to really understand combat. Many students struggle with the whole concept of Mind Intent, but it’s simply the focus of the mind and what it wants to achieve at that particular movement. It is however incredibly powerful in this art, and produces some strange effects! Training and conditioning has to be based on the laws of physics and physiology, and you should try and understand and question every movement you’re doing, don’t just blindly copy others when you have a good understanding of the art. Try and see what works for you…and it is better to have a few excellent techniques than a whole host of watered down copies of what someone else is doing. With Yiquan we get rid of useless techniques/principles, especially unnecessary and flowery movements and unnecessary mental distractions. Perform the actions with a comfortable natural ease with proper body mechanics and a natural harmony with nothing forced, in this way natural energy will rise and become strong. Remember that repetition is the essential key to training the body, mind and energy. Repetition ensures that the central nervous system and your energy and physical body become thoroughly drilled in the movements, so that when your mind directs a movement, it happens effortlessly and very effectively. Beware, however, the generated and cultivated energy can be used for healing and health to yourself and others but has tremendous destructive force if used aggressively! As we have said, we use visualization of various types both passive and active, for example feeling you are standing in a river anchored to the river bed with water up to your neck and stream rushing past you. How does that feel? How will you move? How can you direct your force? The visualizations (and there are many) we employ help us to direct out Mind Intent and use it effectively. We utilize natural coiling, winding and spiraling in all our movements. This creates the silk reeling movement, going through your whole body making your hits and strikes more powerful, and deflecting incoming energy, grips and strikes away from your body. The spiraling starts at the feet, comes through the legs and the waist, which must be flexible (we always encourage students to practice dancing to loosen the waist up!) It then follows through the back and out along the arms and hands. This is also a very healthy set of movements. Essentially the art of Yi Quan (especially) is very difficult to put into words, as so much of it is feeling and experience! Some students just like to practice at home with a book, and no doubt these days You Tube, but the only way is with a competent teacher or guide to take you through the steps. Even then it’s not easy! For this reason this art attracts students who’ve done some years in other arts. This however is not necessary as we will train complete beginners who want to train a lively and exciting art. 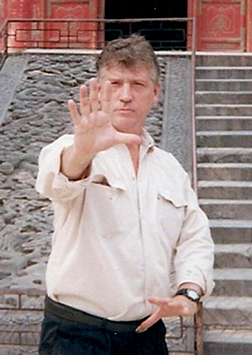 Martin Godfrey has been training various martial arts since 1974 and the Internal Arts (Including Yi Quan and Xing Yi) since 1978. Martin started learning the Japanese version of Yi Quan, called Taiki Ken from friend and teacher Master Jan Voormeij who had learnt it from that founder Kenichi Sawai’s son in law in Amsterdam Holland. After studying around Europe, the states and Hong Kong, Martin studied extensively with Master Xue Si Qi in Beijing (a student of 2nd generation Yao Zhung Zhun, the leading disciple of founder Wang Zhang Xai). Martin has also studied with Wang Zhang Jie in Beijing (the youngest of the students of the founder), and Li Yuan Yu probably the smallest of the original students of the founder! Martin was declared a Boxing Brother of Xue Si Qi in Beijing in 1998. Martin has studied Xing Yi with quite a number of teachers starting with Jan Voormiej in Holland, Sifu Tam , Hong Kong , the excellent Bruce Frantzis ,and others and with Madame Li Qiao Ling and Master Wu Dong in Beijing , both 5th generation family practitioners of Xing Yi going back, respectively to Che I Zhai and Guo Yu Zhen , both renowned boxers in the late 19th early 20th century . We are now giving small group and private lessons and seminars in Milton Keynes, London and Barcelona, with Jan Voormeij teaching in Holland, Israel and other Academy instructors in Sweden and Germany.